Typically this situation is encountered after ear tubes have been placed allowing for any pus from an ear infection to come out. Normally, antibiotic ear drops are prescribed for such infected ear drainage. However, not uncommonly, the drainage persists in spite of numerous courses of antibiotics. In such situations, given pus expression, cultures are now able to be obtained which was not possible prior to tube placement (the pus remained trapped behind the eardrum unless a rupture occurs). Unfortunately, not uncommonly, MRSA is resulted on such cultures which explains why the typical oral and ear drop antibiotics did not work. Typically, if the ear drainage is not that bad, I start treatment with an ear drop, usually either cortisporin, tobradex, or sulfacetamide ear drops. Most other antibiotic ear drops like ofloxin, ciprodex, etc will not work. Watch video to learn how to use ear drops for maximal effectiveness, even if lots of drainage present. Given MRSA usually hangs out in the entrance to the nose, mupirocin ointment is also applied to the nares three times a day. All home/car surfaces (including the skin of family members) need to be sterilized as MRSA tends to stick to everything (more info). If the ear drainage has not resolved after one week, an oral antibiotic is added additionally to the ear drops and nares ointment. Typically, bactrim but occasionally even clindamycin. If the ear drainage STILL has not resolved after one week, typically I than remove the tube, flush the ear out with betadine, and replace the tube with a new one. The thought process being the tube itself is infected with a MRSA biofilm making it particularly resistant to treatment. 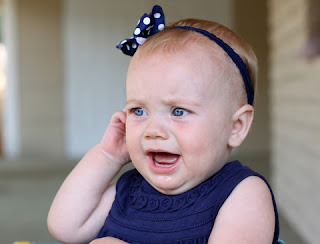 Also, adenoidectomy is performed given adenoid removal significantly helps reduce the frequency of recurrent ear infections, MRSA or otherwise. Occasionally, depending on the patient's (parents') feeling about the matter, the ear tube(s) may be removed and not replaced. While all this is going on... if the patient ALSO suffers from recurrent URI / sinusitis which often (but not always) triggers ear infections, an immune panel bloodwork is obtained to evaluate for any immunodeficiency. After all, MRSA occurs when an individual has received many courses of antibiotics and anything that can be done to decrease the overall frequency of infections everywhere in the body would be a good thing, especially if treatable/reversible. It is not unusual in such situations that serum immunoglobulin for pneumococcal and/or HiB titres are lower than normal. If such low titres are present, I recommend vaccination with prevnar/pneumovax23 and HiB respectively... even if it has already been given at some point in the past. Such vaccinations significantly reduces the number of recurrent sino-nasal and/or ear infections in afflicted individuals thereby reducing the need for future repeated courses of antibiotics separate from what is going on in the ear. Beyond these steps, if MRSA continues to resist treatment, evaluation for more rare triggers can be considered (cystic fibrosis, ciliary dyskinesia, etc).